For other uses, see M2. M.2 (pronounced M dot two), formerly known as the Next Generation Form Factor (NGFF), is a specification for internally mounted computer expansion cards and associated connectors. It replaces the mSATA standard, which uses the PCI Express Mini Card physical card layout and connectors. M.2's more flexible physical specification allows different module widths and lengths, and, paired with the availability of more advanced interfacing features, makes the M.2 more suitable than mSATA for solid-state storage applications in general and particularly for the use in small devices such as ultrabooks or tablets. Computer bus interfaces provided through the M.2 connector are PCI Express 3.0 (up to four lanes), Serial ATA 3.0, and USB 3.0 (a single logical port for each of the latter two). It is up to the manufacturer of the M.2 host or device to select which interfaces are to be supported, depending on the desired level of host support and device type. The M.2 connector has different keying notches that denote various purposes and capabilities of M.2 hosts and modules, preventing plugging of M.2 modules into feature-incompatible host connectors. Used for SATA SSDs, and interfaced through the AHCI driver and legacy SATA 3.0 (6 Gbit/s) port exposed through the M.2 connector. Used for PCI Express SSDs and interfaced through the AHCI driver and provided PCI Express lanes, providing backward compatibility with widespread SATA support in operating systems at the cost of not delivering optimal performance by using AHCI for accessing PCI Express SSDs. AHCI was developed back at the time when the purpose of a host bus adapter (HBA) in a system was to connect the CPU/memory subsystem with a much slower storage subsystem based on rotating magnetic media; as a result, AHCI has some inherent inefficiencies when applied to SSD devices, which behave much more like DRAM than like spinning media. Used for PCI Express SSDs and interfaced through the NVMe driver and provided PCI Express lanes, as a high-performance and scalable host controller interface designed and optimized especially for interfacing with PCI Express SSDs. NVMe has been designed from the ground up, capitalizing on the low latency and parallelism of PCI Express SSDs, and complementing the parallelism of contemporary CPUs, platforms and applications. At a high level, primary advantages of NVMe over AHCI relate to NVMe's ability to exploit parallelism in host hardware and software, based on its design advantages that include data transfers with fewer stages, greater depth of command queues, and more efficient interrupt processing. 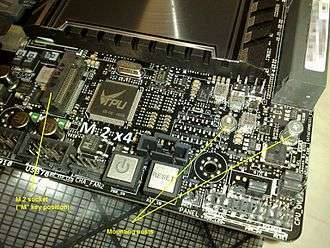 An M.2 socket on a computer motherboard, visible in the upper-left portion of the picture. The socket is keyed in the M position and provides two positions for the mounting screw, accepting 2260 and 2280 sizes of M.2 modules. M.2 modules are rectangular, with an edge connector on one side (75 positions with up to 67 pins, 0.5 mm pitch, pins overlap on different sides of the PCB), and a semicircular mounting hole at the center of the opposite edge. Each pin on the connector is rated for up to 50 V and 0.5 A, while the connector itself is specified to endure up to 60 mating cycles. The M.2 standard allows module widths of 12, 16, 22 and 30 mm, and lengths of 16, 26, 30, 38, 42, 60, 80 and 110 mm. Initial line-up of the commercially available M.2 expansion cards is 22 mm wide, with varying lengths of 30, 42, 60, 80 and 110 mm. An M.2 module is installed into a mating connector provided by the host's circuit board, and a single mounting screw secures the module into place. Components may be mounted on either side of the module, with the actual module type limiting how thick the components can be; the maximum allowable thickness of components is 1.5 mm per side. Different host-side connectors are used for single- and double-sided M.2 modules, providing different amounts of space between the M.2 expansion card and the host's PCB. Circuit boards on the hosts are usually designed to accept multiple lengths of M.2 modules, which means that the sockets capable of accepting longer M.2 modules usually also accept shorter ones by providing different positions for the mounting screw. M.2 keying notches in B and M positions; overlapping of the pins on different sides of an M.2 module is also visible. 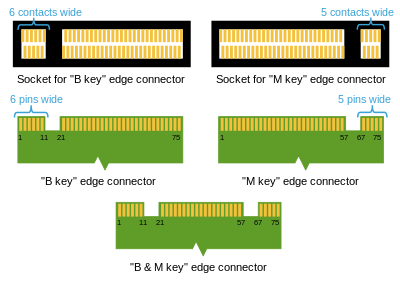 For example, M.2 modules with two notches in B and M positions use up to two PCI Express lanes and provide broader compatibility at the same time, while the M.2 modules with only one notch in the M position use up to four PCI Express lanes; both examples may also provide SATA storage devices. Similar keying applies to M.2 modules that utilize provided USB 3.0 connectivity. Various types of M.2 devices are denoted using the "WWLL-HH-K-K" or "WWLL-HH-K" naming schemes, in which "WW" and "LL" specify the module width and length in millimeters, respectively. The "HH" part specifies, in an encoded form, whether a module is single- or double-sided, and the maximum allowed thickness of mounted components; possible values are listed in the right table above. Module keying is specified by the "K-K" part, in an encoded form using the key IDs from the left table above; it can also be specified as "K" only, if a module has only one keying notch. Beside socketed modules, the M.2 standard also includes the option for having permanently soldered single-sided modules. 1 2 3 4 5 6 7 8 9 Jim Handy; Jon Tanguy; Jaren May; David Akerson; Eden Kim; Tom Coughlin (September 20, 2014). "SNIA Webcast: All About M.2 SSDs" (PDF). SNIA. Retrieved July 15, 2015. 1 2 3 "SATA M.2 Card". SATA-IO. Retrieved September 14, 2013. 1 2 3 Mark Kyrnin. "What Is M.2? New Interface and Form Factor For Compact SSD Drives in Laptops and Desktops". compreviews.about.com. Retrieved July 15, 2015. 1 2 3 4 5 6 7 8 "M.2 Connector (NGFF) Introduction" (PDF). orvem.eu. ATTEND. Archived from the original (PDF) on February 3, 2014. Retrieved January 17, 2014. 1 2 3 Dave Landsman (August 9, 2013). 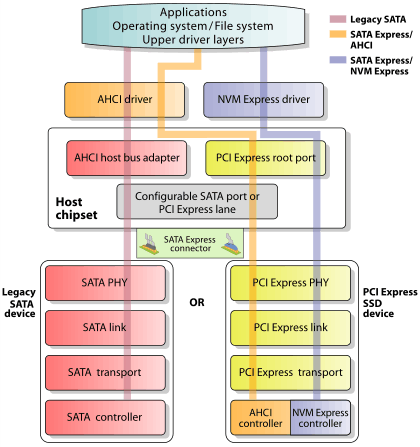 "AHCI and NVMe as Interfaces for SATA Express Devices – Overview" (PDF). SATA-IO. Retrieved July 15, 2015. ↑ "SATA-IO FAQ: What is the M.2 card and what is the status of the specification?" (PDF). SATA-IO. August 8, 2013. p. 2. Retrieved July 15, 2015. ↑ "Serial ATA Revision 3.2 (Gold Revision)" (PDF). knowledgetek.com. SATA-IO. August 7, 2013. pp. 194–209. Archived from the original (PDF) on March 27, 2014. Retrieved July 15, 2015. 1 2 Paul Wassenberg (June 19, 2013). "SATA Express: PCIe Client Storage" (PDF). SATA-IO. Retrieved October 2, 2013. ↑ "PCI Express M.2 Specification Revision 1.0". PCI-SIG. 2013. Retrieved December 14, 2013. ↑ "M.2 Frequently Asked Questions". Kingston Technology. Retrieved July 15, 2015. 1 2 3 4 5 6 7 "M.2 (NGFF) Quick Reference Guide" (PDF). Tyco Electronics. Retrieved November 16, 2013. 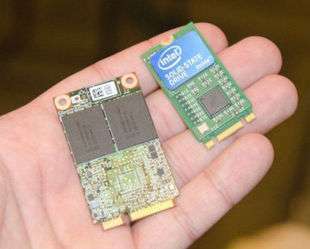 ↑ "Intel SSD 530 Series Arriving Next Week – Feature NGFF M.2 Interface". wccftech.com. Retrieved September 14, 2013. ↑ "M2P4S M.2 (NGFF) PCIe base SSD to PCIe ×4 Adapter". hwtools.net. February 14, 2014. Retrieved June 22, 2014. ↑ John Burek (April 14, 2015). "2015 Guide: The Best M.2 Solid-State Drives". computershopper.com. Retrieved July 15, 2015. ↑ "SMBus interface for SSD Socket 2 and Socket 3 (PCI-SIG engineering change notice)" (PDF). PCI-SIG. August 11, 2014. p. 2. Retrieved August 5, 2015. 1 2 3 Marshall R. (April 7, 2014). "Buying an M.2 SSD? How to tell which is which?". Asus. Retrieved April 28, 2014. ↑ Jack Zhang; Mark Liang (July 4, 2015). "NVM Express Based Solid-State Drives: Crossing the Chasm, Going Mainstream" (PDF). Intel. p. 39. Retrieved August 27, 2015. ↑ Les Tokar (November 24, 2013). "Understanding M.2 NGFF SSD standardization (or the lack of)". thessdreview.com. Retrieved April 28, 2014. Wikimedia Commons has media related to M.2.